Originally, we took over two years to decide what breed of sheep to work with. We chose Icelandic sheep because they are very versatile. They are sometimes referred to as a triple use breed. That is because they produce excellent wool, excellent meat, and plentiful milk. We think they are an excellent choice for the small holder. I have a friend who occasionally gets 3 bummer lambs from the local sheep shed for $50. Most of the time they make it, sometimes they don't, but there is a lot of work involved. I would rather have my ewes do the work. honestly, they want to do it. Granted, other lambs may grow larger, but it takes longer, and requires supplemental feed. Below, I go into more detail on why we chose Icelandic sheep. Grass is the best feed for Icelandic sheep. No grain, and no alfalfa is required. We feed our sheep hay over the winter when the pastures are not producing (Typically the end of November to through March). We have tried many different types of hay. Dairy alfalfa hay is commonly grown in our area. When it was cheap, we have used it. We have to limit how much we give our ewes when on this rich of a feed. They eat it with relish, and tend to get butterball fat over the winter. Which is not so good for spring lambing. We have tried a 60/40 mix of orchard grass straw/ hay mix, they were not real thrilled by it. they wasted a lot, and did not put on much weight during the winter. They really enjoy 100% orchard grass, or teff hay. We have had no problems changing over from pasture to grass or teff, and back. Our pastures are almost 50% orchard grass so this is understandable. Icelandic sheep do well in cold climates. We occasionally see winter temperatures below 0°F. Our sheep have a shed available during the winter, but they only use it when they can not find a bare spot on the ground, or when it is hailing. They actually prefer the open pasture. They will be calmly grazing in 35 mph winds, and we do see that. I have often gone out for the morning feeding, and the outside inch of wool is icy and frozen. We live in high desert, so they also see summer daytime temps above 100°F. All the sheep need is a little shade, and plenty of water. Granted our average temperatures are a little more extreme than Reykjavik. but Icelandic wool makes good insulation, winter or summer. In the aftermath of the surprising early winter storms of 2012. An Icelandic ewe set a record having been buried in snow for 45 days before being rescued by a shepherd. I did not get the real feel for how buried they were until I saw a video of the rescuers digging out sheep. That brings us to the wool. It comes in colors! Well, black, brown, grey, and white. Each fleece has two distinct types of wool. The fine undercoat, (thel) and the coarser outer coat (tog). The thel is so fine it can be used for baby clothes. The tog is coarser, and has exceptional water shedding properties. The tog and thel can be spun separately, or combined into a yarn that exhibits both characteristics. Additionally, there are different color patterns that make Icelandic sheep distinctive. solid, gray, badgerface, or mouflon, and spotted. When you see an all white Icelandic, they in reality, have one really big white spot. Gestation is about five days shorter for Icelandics compared to the average gestation for sheep. Because the unborn lamb does most of its growth in the last trimester. This means slightly smaller lambs, and fewer lambing problems. This smaller birth weight is compensated for by the next benefit, which is the high feed conversion rate shown by Icelandic sheep. The lambs start smaller, but they grow faster than other breeds on average. This is all on grass pasture, and their mother's milk. The high feed conversion rate, and faster growth means that ram lambs dress out at about 40 lbs in under six months. Or, they can be left growing till the next summer when they will hang at about 80 lbs, and still be excellent lamb. Because of their fast growth, there is no advantage in castrating lambs bound for the freezer. Do you know that most sheep naturally have long tails? Most sheep have to be docked. A long tail can get very nasty, very quickly. This can cause problems affecting the health and safety of sheep. Icelandic sheep have naturally short tails. The short fluke shaped tails are one of the identifiers of Icelandic sheep. It is considered so important, that a docked tail excludes a lamb or adult sheep from registration as a pure bred icelandic. The typical Icelandic ewe can produce enough milk to feed two lambs and be milked once a day. Ewes milk is typically high in protein, and makes excellent cheese. Pecorino Romano is probably the most common sheep cheese sold in the US. There are several boutique sheep dairies that feature Icelandic sheep's milk yogurt and cheeses. Icelandic sheep naturally come in either horned, or polled (no horns) varieties. There is really no difference (other than the horns) between them, and most Icelandic sheep in the United States, and Canada will have both horned, and polled in their pedigree. The horns are not limited to rams alone, ewes are just as likely to have horns too. Whether one chooses horned or polled is a management, or aesthetic choice. Primarily we chose polled due to the type of fencing we use. Secondly, horns are a sheep's weapon of choice, and they can be formidable. However, I might have chosen horns if I was concerned about large predators. We only have to deal with dogs, and coyotes. A good fence, and bottle rockets will keep them away. Finally, there is the the leadersheep. 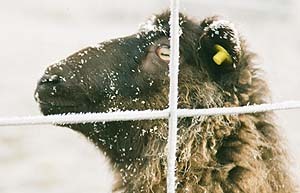 The leadersheep are sometimes considered a sub-breed of the Icelandic sheep. However, it is more of an inheritable attribute than anything else. The modern domesticated sheep has a brain that is 24 percent smaller than the wild European sheep. Icelandic sheep being a primitive breed are closer to the wild sheep than most domestic breeds. They are closer to the intelligence of the wild sheep as well. The Icelandic leadersheep has a higher innate intelligence than other Icelandic sheep, and exhibit an intuitiveness that is uncanny. Most people that have raised leadersheep have stories of their unique behaviors and amazing intelligence. There are many stories in Iceland of leadersheep sensing weather changes, and refusing to lead the flock out of the barn. Even though there are no large predators in Iceland, the first leadersheep brought to North America recognized the presence of large predators in their area. An excellent documentary on Icelandic leadersheep can be found on YouTube. I would recommend it if you are interested in this unique breed. Our sheep have enriched our lives in many ways. There are very few things more relaxing than caring for sheep. They are very grounded and really have their priorities in order. When I go out with a feed bucket on a cold winter morning, and our lead ewe is running back and forth in the pasture. She then suddenly jumps straight up, almost 2 feet off the ground from shear joy, spinning about, to land facing the opposite direction. I can not help but smile. The joy is contagious. If you are interested in what the experts say about icelandic sheep, visit the Oklahoma State University webpage for more information on Icelandic sheep.